As the beast has headed to pastures new in North London, I thought I would take this moment to reflect on some fine dining in Clapham as an homage to my time residing in SW4. If you’re looking for something different and charming, the Dairy is it. A breath of fresh air, The Dairy is unpretentious yet inventive employing an eclectic small plates ‘tapas’ style concept using the freshest ingredients (and the most beautiful serving dishes I might add). The Dairy is great for many reasons. For starters, they give you free food. In this day and age, that is rare and something to be valued. 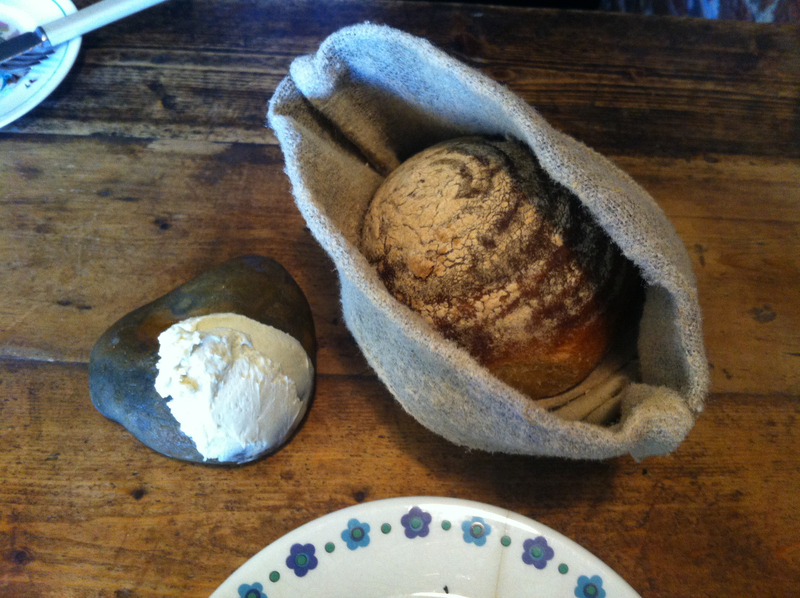 They bring out homemade rustic warm sourdough bread hiding in a little jute sack, served with a dollop of butter on a large pebble. I don’t know how people come up with the idea to serve butter on a pebble, but I like it. The butter is absolutely exquisite: it has been whipped up with smoked bone marrow and is luscious, creamy, and light all at the same time. Basically, pretty awesome. If that wasn’t quite awesome enough, we were served a complimentary starter of lettuce wedges topped with bacon, crumbled burnt kale and a scoop of creme fraiche. Normally the beast wouldn’t become overexcited about some free rabbit food but it tasted so fresh, it was hard to pretend I didn’t enjoy it. 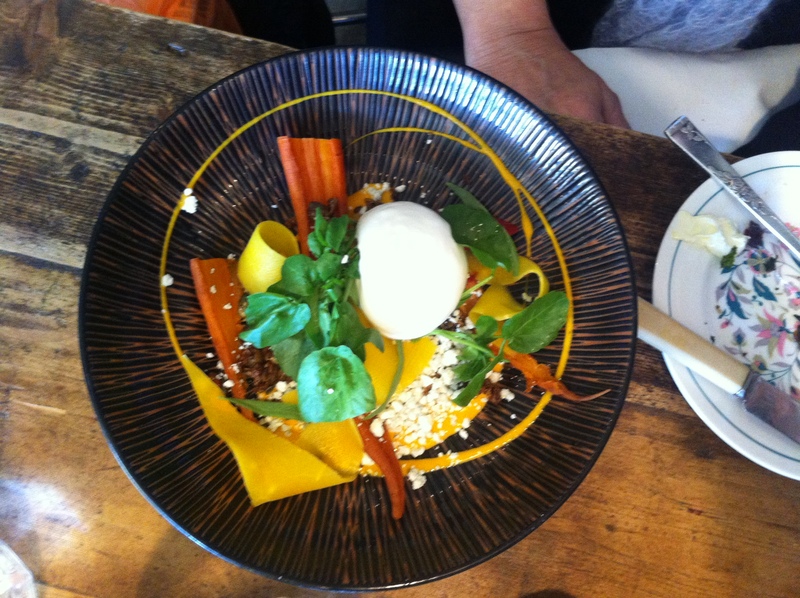 There was a dish of rooftop carrots, goats cheese, oat granola, and buttermilk — bursting with colour and flavour. Even the onion soup wasn’t just ordinary onion soup. Only at this place would they refer to it as ‘Roast Roscoff onion broth with Montgomery cheddar,’ serve the bowl of onions, and then pour the onion broth over the plate from a tea kettle, referring to the broth as ‘onion tea’. Yes, that actually happened. 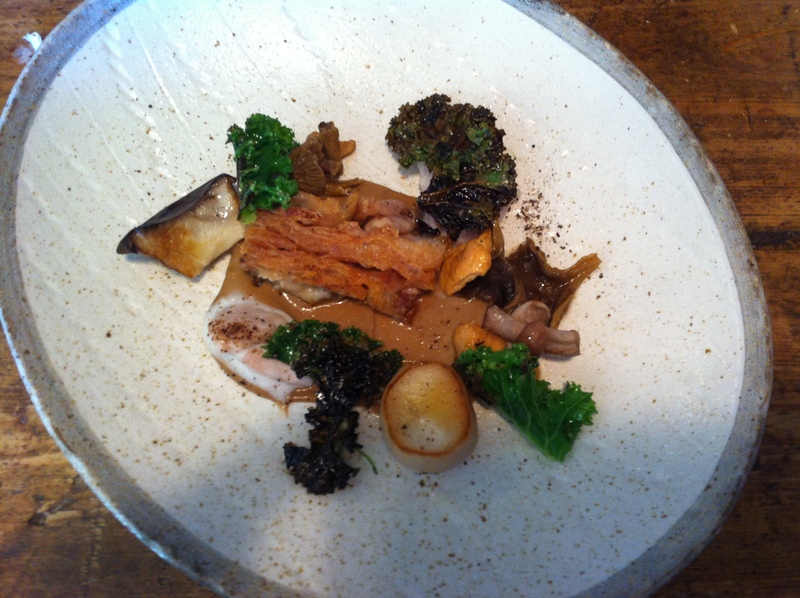 The chicken was something special — crispy skin and cooked just right, served with burnt kale (they just love kale here) and wild mushrooms. Simple yet delicious. This habit they have of using the same vegetables in many different dishes – I have the feeling it’s because they know the vegetables they’ve got are so good, the chefs know they’re good, so they figure why not use them in everything? And why shouldn’t restaurants do this? Serve the best vegetables you’ve got instead of making variety for the sake of variety and using sub-par ingredients, especially vegetables that aren’t right for the season. This is the part where I mention they still had a great selection of vegetables on offer. Bloody brilliant — how do they do it?! The meal was a series of small surprises, from the little explosions of taste in the onion soup — the fresh onions, sweet broth, cool liquid cheddar, salty crunchy crouton topping — to the crispy and yet tender chicken, it definitely leaves you wondering what every other dish you didn’t order looks (and tastes) like. And then, just when you think it’s over, the waiter serves a (complimentary) vintage biscuit tin filled with a dessert medley. 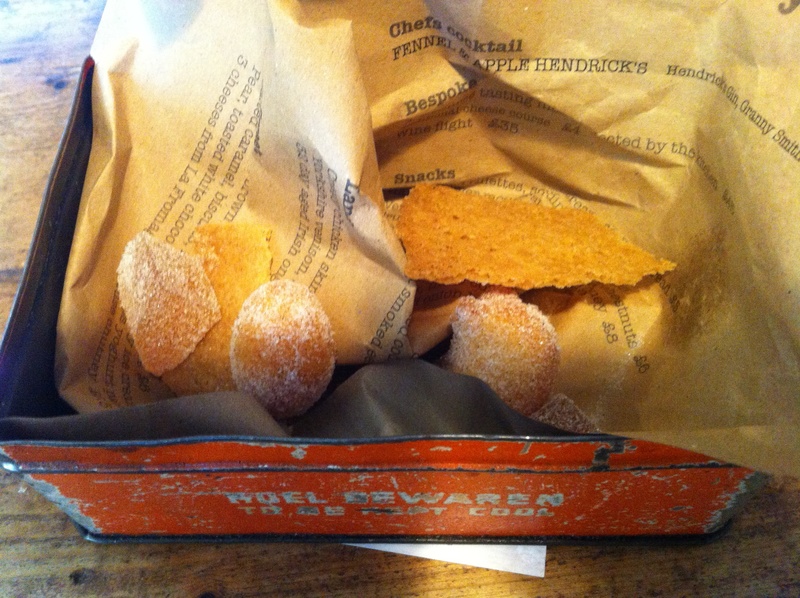 Resting inside the tin on a bed of folded up paper menus are small homemade doughnuts dusted with sugar, pieces of sweetened shortbread, and compact little jellied fruits coated in crystallized sugar. I would say if you’re feeling particularly ravenous, The Dairy might not be the place. Lunch requires 3-4 small plates per person and I thought it was a moderate amount of food, nothing that’s going to overly fill you if you’re looking to slip into an afternoon food coma. This could be a good thing or a bad thing depending.. 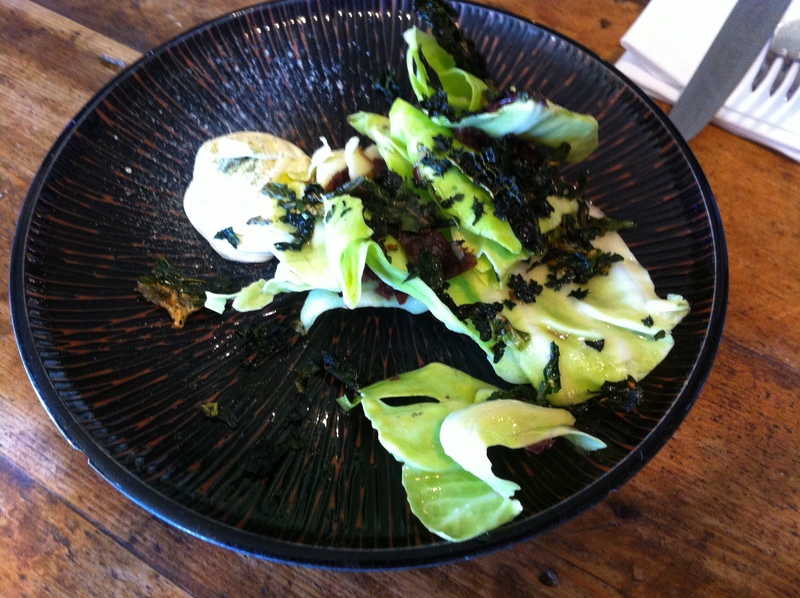 The food is surprising (in a good way), clever and ambitious and the menu and style are nothing short of refreshing. Even the plates on which the food is served are beautiful and intricate. 10/10 for presentation and uniqueness. Definitely worth checking out. 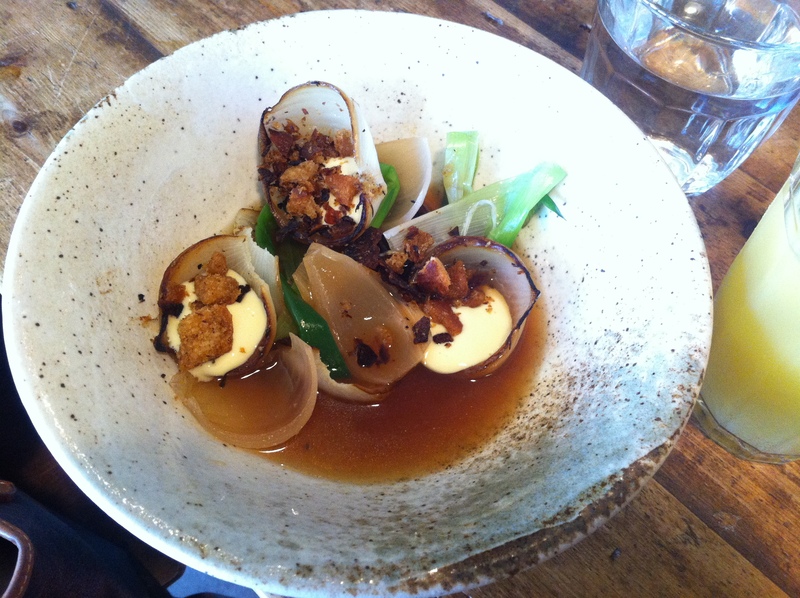 Posted in Restaurant Reviews - LondonTagged artistic, bone marrow butter, Clapham, Clapham Common, inventive, Kale, small plates, style, The Dairy, unpretentiousBookmark the permalink. Wow, all very inventive and exciting. Can’t wait to try this place. And had to look it up but glad I now know what a jute sack is. Great review RB!